Coach Smallworth was approached in 2005 by ex-players of Cornwall’s only other successful football team, the Duchy Destroyers which folded some 11 years previous. Coach Smallworth had just finished coaching the Bristol Aztecs having taken them from being at the bottom of their division to National Champions in his first year as Coach. He did some homework about setting up the team and asked rugby players, sports centres and others in the sports fraternity in Cornwall what they thought about the idea and the response was all favourable, all were excited about the prospect of having a new team in Cornwall. He decided on Newquay as the venue for training and playing games having looked at venues from Penzance in the South of the county to Bude in the North. Newquay is a popular tourist destination and away teams love to make a weekend of it when they come to play but the town has also been designated an “Enterprise Zone” which makes it even more attractive as a “destination of choice”. Working with Richard Atkinson (who was Chairman of the Club for 8 years and a previous player at the Duchy Destroyers) they placed adverts in local newspapers, on radio and on websites asking for players for the Cornish Sharks. They were astounded when 140 prospects turned out for the first trials in 2005. Some had played before, many were rugby players but 60 were complete rookies to the sport. A number of Americans from the local airbase also turned up for trials, all of whom had played before. 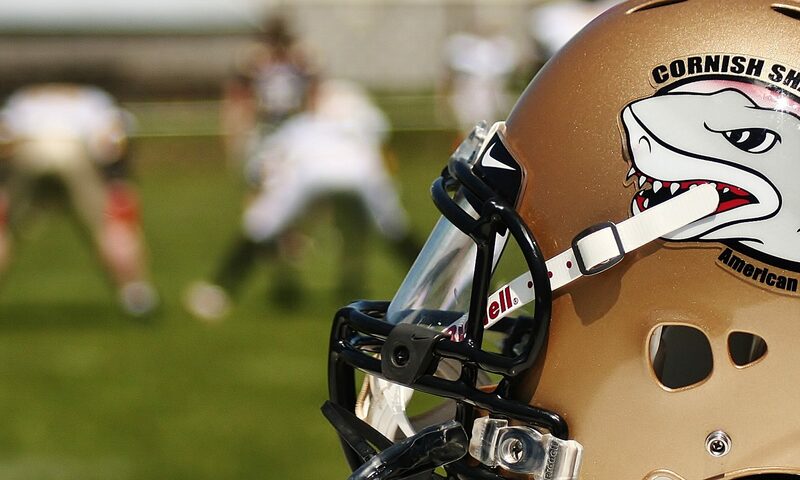 They even managed to sign a linebacker in Las Vegas that had played for the San Francisco 49ers who played for the team for a few weeks before returning to the States. They then set about recruiting coaches again using adverts and by word of mouth. Equipment was the next urgent matter with which they had to deal and they used their previous contacts to get them started. Coach Smallworth had been head coach of the London Mets (the team of the Metropolitan Police) and left them as No. 4 in the nation. 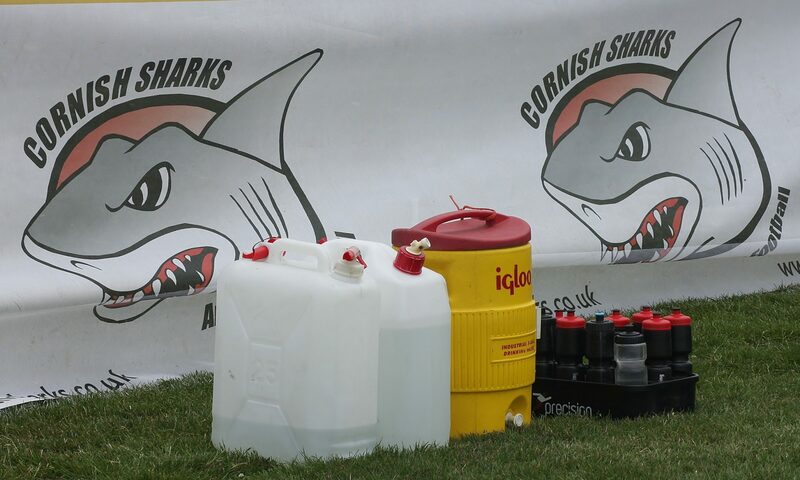 The London Mets donated some kit to the Cornish Sharks. The Duchy Destroyers also gave the team some old equipment and they applied for a National Lottery Grant which they also put towards new equipment. 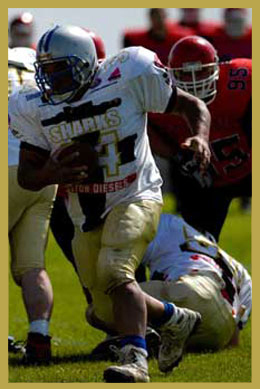 The success of the Lottery Grant was due to the fact that the Cornish Sharks were aiming to bring American Football to a deprived area and encourage the local youth to take part. They also managed to raise sponsorship from 13 local businesses each offering varying amounts of money or goods in kind. They put together a training programme together for the squad which had reduced to a manageable size of 50+ players – some weren’t suited and some just didn’t enjoy it – a contact sport is not for everyone. They set goals for their first year namely, to qualify to play in the league for 2007 – so they had to get the team ready to play two games against affiliated teams to qualify. 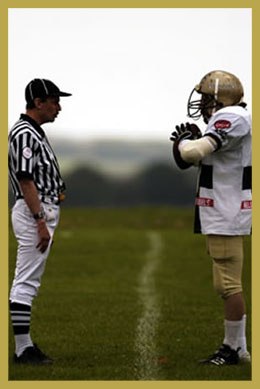 They played two competitive games – one in Reading and one in Lincoln – both away games. Having trained the team to a good standard they won both games quite convincingly with no points scored against them in either game, hence earning the nickname “Killer Sharks”. Having qualified to play in the league in the South West Division they were ready for new season in April 2007.